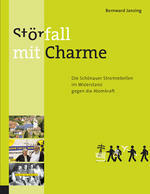 The title, Störfall mit Charme, is a playful thumbing of the nose in German at the critics of a movement by citizens in a small village in the deepest reaches of Germany’s Schwarzwald or Black Forest to dump nuclear power and build a renewable energy future. The subtitle, Die Schönauer Stromrebellen im Widerstand gegen die Atomkraft, is more direct, describing the revolt by the people of Schönau against nuclear power. This is a charming little book written by freelance journalists Bernward Janzing, Dieter Seifried, and Martin Rasper and a good reason to brush up on your German. Even if your German isn’t up to the task of working your way through the text, you can still enjoy the photos by award-winning photo journalist Jan Oelker (the author of Windgesichter [The Face of Wind Energy]). The short, simple captions are digestible even for those of us not fluent in German. I first wrote about Schönau in 2006 after coming across a description of their revolt in Franz Alt’s Krieg um Öl oder Frieden durch die Sonne (War over Oil or Peace through the Sun). 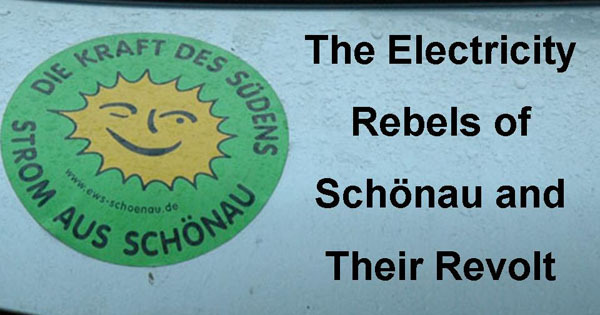 See Strom Rebels of Schönau: The Village That Built Their Own Solar Utility for my take. Janzing’s book was published in 2008 and is the most thorough and colorful account of this inspirational story. By skimming the book, I could quickly tell I got some details on the story wrong. You really need to either have been there or have the ability to read German to grasp the full extent of what the people of Schönau accomplished and how they did it. In short, the book chronicles the campaign by citizens of Schönau to take over their local electric utility so they could stop buying nuclear-generated electricity. They wanted nothing to do with nuclear after Chernobyl. They wanted to use the village’s old hydroelectric plant and other forms of renewable energy instead. As you can imagine the utility opposed this and therein is a made-for-TV drama: plucky villagers take on corporate power brokers. About the title, Störfall is an accident, event, or calamity. The story goes that critics of the citizen activists were dismissive about the whole endeavor. After all, what do villagers know about generating and distributing electricity? The villagers were doomed to failure if they succeeded. If the villagers took over the utility, it would be a disaster for the village, a Störfall. However, as Craig Morris explains in his book Energy Democracy, Störfall has a broader meaning in German than a mere chance event. The word also means an intentional disruption until failure occurs. The clever villagers turned the haughty criticism into a campaign slogan: Ich bin ein Störfall (I am the disruption). In effect saying, “We are the disruption that will lead to failure (of the utility).” In the days before social media, the campaign slogan went viral, appearing on TV and in movie theatres for free as a battle between rural Davids against corporate Goliaths. And this is just one example of how the villagers turned what on the surface appear as overwhelming disadvantages into assets and how they did so with biting humor—Charme in German. The rebellious villagers persisted. They eventually bought their utility and now run it their way with renewable energy. One of the leaders, Ursula Sladek, went on to win the Goldman Environmental Prize, the world’s most prestigious award for environmental action, and subsequently met with then-President Barack Obama. She and the Strom Rebels of Schönau became a beacon of hope for renewable-energy activists everywhere, not just in Germany but around the globe. The story of Schönau is hard for North Americans to grasp in many ways. A village in the hinterlands takes control of its privately-owned utility? Why would they even want to, we would ask? Do Germans have the right to do that? Do we? And it’s for this reason that books such as Janzing’s Störfall mit Charme should be studied by renewable energy advocates and energy policy gurus in the English-speaking world. It’s a story that stirs the imagination of what is possible. Janzing, Bernward, editor. Störfall mit Charme: Die Schönauer Stromrebellen im Widerstand gegen die Atomkraft. Freiburg, Germany: Doldverlag, 2008. 128 pages. ISBN: 9783927677562 cloth. 16.82 €. 22 x 17.2 x 1.6 cm. Printed in Freiburg, Germany. KWR – wer war das eigentlich? 5. 75.000 Kunden, was nun?